Image: Warner Bros., Getty Images. Design: Ashley Britton SheKnows. For entertainment, 2018 was a big year. Over the last 12 months, we’ve met tons of new movie characters (that we promptly fell in love with), indulged in all the goodies peak TV had to offer and watched celebs live their lives with total fascination. But now, with 2019 on the horizon, it’s time for a little progress report. How is Hollywood doing 12 months later? There has been progress in some areas, but other areas are still lagging. In short, the good work isn’t done quite yet, and it’s important to remember that diversity and equal pay aren’t just trends. The studios still have to find a way to make a difference. We do think Hollywood was on a better path in 2018, but there are a couple of patterns that need to stop repeating. Here are some New Year’s resolutions and suggestions for Hollywood in 2019. Hollywood hasn’t met a reboot it doesn’t love. In 2018 alone, movie audiences saw new versions of A Star Is Born, Tomb Raider, Robin Hood and Overboard in theaters. Some of these films, like A Star Is Born, are headed to the Oscars, but others, like Tomb Raider, didn’t need to see the light of day. Hollywood is supposed to be the land of dreamers and creatives. If a filmmaker has an interesting perspective to bring to a known property, then we are open to a reboot. If they are just going to regurgitate the same story all over again, there’s no need to do it again. Television, we’re talking to you, too. Murphy Brown, Magnum P.I. and American Idol are just some of the titles we saw return in 2018. This might be a controversial thought since Aquaman is in theaters now and breaking box office records overseas. It’s also hard to even write this when Patty Jenkins delivered such a beautiful film with Wonder Woman in 2017 and Ryan Coogler gave us a complete superhero tale in Black Panther. We don’t think these movies should go away completely — but maybe we need fewer of them each year. The summer film season feels like one big superhero movie week after week. If Hollywood changed it up a little bit by offering a romantic comedy or an independent film on the same weekend as another Marvel film, we might be able to see the light again. If you paid money to see a big blockbuster like Ocean’s Eight or a small indie film like Eighth Grade, you understand how important these stories are. 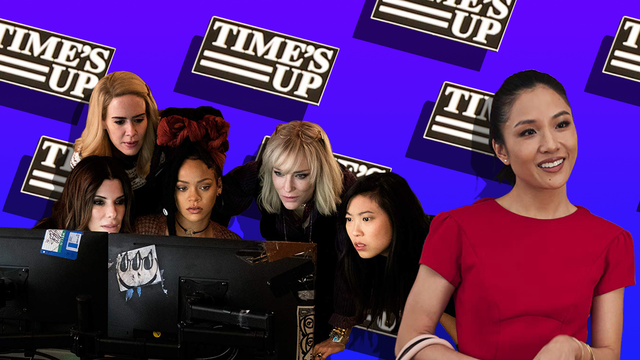 Women can be many things on film — strong and powerful like Rihanna and Sandra Bullock in Ocean’s Eight, or vulnerable and learning to find their voice like Elsie Fisher in Eighth Grade. It’s important to tell all of these tales because many us identify with all of those women. We have been them at one point or another in our lives. Hollywood needs to keep promoting more women-centered movies, and we will continue to buy those tickets at the box office. In fact, the Motion Picture Association of America did a study and found that women and people of color are very reliable movie audiences. So why isn’t Hollywood making more films for these moviegoers? Unfortunately, Hollywood sometimes uses diversity as a trendy buzzword that can be thrown into the most boilerplate kinds of stories when, really, diversity and representation are much deeper and more important than that. If the runaway success of big studio films Black Panther and Crazy Rich Asians proved anything in 2018, it’s that stories led by people of color are long overdue. The entertainment industry needs to also study who went to those movies — it wasn’t just Black or Asian and Asian-American audiences. These were monster hits because they were well written and also touched on important topics within those specific communities, like Black Panther’s subtle comments on Black communities reclaiming power and how they can move toward liberation from oppression or Crazy Rich Asians’ nuanced discussion of identity as it relates to the Asian vs. Asian-American experience. Films with leading LGBTQ characters had some successes in 2018, including Love, Simon, which captured a beautiful love story where the main character is a gay teen. Bohemian Rhapsody was also a mega-success at the box office, which led more people to discover Freddie Mercury’s legacy, even if the retelling of his personal life was imperfect. There need to be more transgender stories told and shared in more authentic ways. The Belgian film Girl is stirring up controversy for going too far in the wrong direction, and Queer Eye discovered that there are prejudices within the LGBTQ community when it comes to accepting transgender men and women. Hollywood has to find a way to tell trans stories in a beautiful and healthy way. Many Hollywood unions and other organizations have adopted strict code-of-conduct rules since more sexual harassment and assault allegations have come to light. People who have been marginalized in the entertainment industry felt more empowered to speak up after an exhausting year of allegations and denials. More women and people of color are finding ways to unite and learn more about each other’s stories, and some men in power are listening to these stories and fighting for their colleagues’ right to equal pay. Hollywood isn’t perfect, and it’s a constant work in progress. If the entertainment industry strives to follow a few of these New Year’s resolutions, we will start seeing a stronger and better Hollywood that represents more of what America really looks like.